Born on 14 July 1850 in the agricultural town of Brives in central France, Charles Bertrand d'Entraygues’ artistic career was based on the depiction of scenes that he must have witnessed during his formative years. The interiors of modest homes filled with children playing or families gathered around the dinner table are typical of d’Entraygues’ mature imagery as are paintings of choirboys engaged in playful, if slightly mischievous, activities. As a young man, d'Entraygues began his studies at the Ecole des Beaux-Arts in Paris under the tutelage of Isidore Pils, an artist whose paintings often focused on the lives of ordinary people and the poor. When d’Entraygues arrived in Paris, the city was still reeling from the destruction caused by the 1871 blockade during the Franco-Prussian War. In fact, his instructor Pils was one of several artists who documented the horror of the bloody siege as well as the ruin of the many buildings. In spite of failing health, Pils continued to teach, and to exhibit his works at the Salon until his death in 1875; the following year, d'Entraygues made his Salon debut with L’Embarras du choix [Embarassment of Riches]. This was the beginning of a long career of academic success. 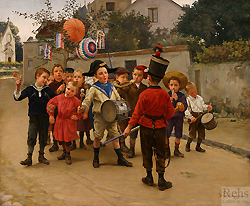 During the 1880s, d’Entraygues established a reputation for charming genre scenes featuring children. His 1882 Salon entry, La table des enfants, exemplifies his signature style, based in part on the humorous tradition of Dutch genre imagery, and in part on the French narrative painting that was developed in the eighteenth-century by artists such as Jean-Baptiste Greuze. In La table des enfants, children of all ages are gathered around a festive table, covered in white cloth and filled with food. To the left of the large table, an open doorway frames a view of the adults enjoying their own celebration in an adjacent room. The focus, however, is on the children’s merriment; one boy concentrates intently on chewing his food while the others watch—apparently witnessing some kind of competition or dare. One small girl in the foreground, clearly disinterested in the eating contest of the boys, plays with her doll, while the toddler at the end of the table is completely obscured by the giant bowl tipped up to her face. Even the family dog joins in the fun as he begs for scraps at the table, having abandoned the bowl of food placed on the floor. The setting, although modest, is clearly the home of a provincial middle-class family. This type of anecdotal genre painting became increasingly popular in the last half of the nineteenth century. As d’Entraygues’ career illustrates, these amusing subjects were extremely successful at the Salon, but they were also much admired by the expanding bourgeois art collector. 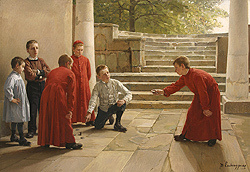 Children Playing from 1884 illustrates just how well d’Entraygues organized his studio for the production of this type of image. The setting for this painting is a variation on the setting of La table des enfants, clearly a ‘set piece’ that the artist could alter as needed to suit the composition. Even the children seem to be based on the same models, probably members of d’Entraygues own family. In general, these paintings are small in size and would have been quite affordable for the bourgeois buyer. In fact, the commercial art market in fin-de-siècle Paris was expanding quickly. As more and more artists challenged the judgment of Salon juries, and as the economy rebounded from the wreckage of the Franco-Prussian War, private art galleries found a ready audience for reasonably priced naturalist paintings. Although only a select group of clients were interested in the modernist experiments of post-Impressionism, there were many well educated and financially comfortable patrons who sought out artwork that conveyed the kind of bemused or entertaining message that d’Entraygues created. Like many of his colleagues, d’Entraygues also courted American art collectors, who represented a rewarding market for French genre painting. He was particularly fortunate to have one of his paintings, Refreshments After Toil from 1887, included in the 1894 publication of Famous Paintings of the World. “We have here one of those idylls of homely life, which, well chosen and sympathetically delineated, are among the most universally acceptable subjects that can be placed on canvas. With an abundance of merit for the appreciation of the art connoisseur, the essential quality of this picture is found in the little family group, so full of happiness and innocence.” [ii] This kind of positive exposure was invaluable in assuring potential American buyers that d’Entraygues’ work was of the highest quality. Salon 1901 - #739 – Croque-le! [i] Gustave Haller, Le Salon, dix ans de peinture: Salon de 1901, (Paris: Calmann-Lévy Editeurs, 1902), 344. [ii] Famous Paintings of the World (New York: Fine Art Publishing Company, 1894) 225.